Discover how the Panasonic 824, NS700, and KX-TDE500 can automate your Hotel or Hotel Office, by routing calls to rooms or customer service 24 hours a day 7 days a week and even on holidays. The Panasonic Hotel Phone System is an affordable small to large hotel system with minimal needs to advanced requirements. The Panasonic KX-TDE600 is a powerful advanced full featured hotel motel phone system for a Hotel with the needs of up to 900 phones or more. An automated attendant system can also route calls 24 hours a day 7 days a week and offsite when the Innkeeper has to run errands. All and all a modern Hotel Phone System can leave more time for the hotel inkeeper to operate the hotel. The Panasonic 824, NS700, and KX-TDE600 phone system is an affordable Hotel Telephone System that can support analog single line phones for up to 900 rooms, plus one operator or reception phone, with up to 8 to 23 incoming lines. A typical Hotel Phone System would not require that many incoming lines. One unique feature of the Panasonic for a Hotel is it can expand up to 900 telephone ports that can support either a proprietary business multiline phone or what are know as analog room phones. The Panasonic KX phone system can accommodate as many as 900 room phones with call accounting for the telephone bill, voice mail, a wake up call and more hospitality features needed for most Hotel/Motel Applications. The Panasonic 824 phone system can be expanded up to 24 phones for a Hotel. If you have the need for up to 23 Hotel Room Phones plus the need of an office phone with out the need of voice mail the Panasonic 824 would be a good fit for a Hotel. If you have the need for voice mail on your Hotel Telephone System an office phone, the Panasonic 824 phone system can support up to 21Hotel Room Phones. 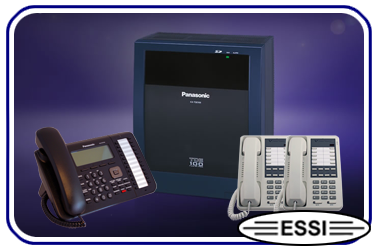 The Panasonic 824 phone system can be interfaced with most any Hotel Room Phone as long as it is an analog phone that is not proprietary to any other brand of phone system. Quality Hotel Phones manufactured by name brand electronics manufacturer like Panasonic, Vodavi , & Cortelco. Support and training for the life of your Hotel Telephone System to the original owner. The best way =ESSI= can Save You Money is if you can purchase your Hotel Phone System wired in we can save you money with our free remote programming services with 60 days of updates. Remote system programming services that lower the cost of maintenance fees as a tech visit is not required. Hotel Telephone System installation, training, and support available nationwide. All you have to do is say yes and we will have your new Hotel Telephone System installed in days of it's delivery with training. We also provide remote programming services available via an existing Cable/DSL internet connection that will save on maintenance costs. The latest advancements in phone system technology, the Hotel Reception Console is no longer necessary as a display on a newer model telephone will show the room number that is calling. Is not only an amazing addition it can also ring on an in keepers cell phone while out running around town. Choose from a selection of 3 Office Phones for a Hotel Telephone System. The 24 Button Phone can provide lots of features at your finfer tip. The latest Panasonic Cordless Phone System can provide Cordless Phone Coverage of up to an entire Hotel or Motel property with Expandable Cell Stations.. Choose from a large selection of affordable Hotel Room Phones. We have multiline phones for the visiting executive to just plain analog single line phones.